Pretzel Logic's Market Charts and Analysis: Will the Market Repeat this Fractal? Will the Market Repeat this Fractal? There's been no material change in the S&P 500 (SPX) since last update, and 1750 +/- is still the critical zone for bulls to claim -- so today we're going to take a look at some other markets. The first is the Philadelphia Bank Index (BKX). As most of us remember, at one point in the now-seemingly-distant past, the country was experiencing a "financial crisis." That was, of course, back before the government realized that all they had to do was buy anything and everything in order to create an atmosphere where businesses would thrive and unemployment would plummet and the economy would heat up... or wait, none of those things have happened. Let me consult my notes here... here it is: they realized they could create an atmosphere where at least the prices of assets would keep rising no matter what, since there's always One Big Buyer waiting at the end of every transaction. Anyway, somewhere in there is one of the reasons I still pay a lot of attention to what the financials are doing. I found this chart interesting, because the current pattern is an almost-perfect fractal of the move from January to May of this year. 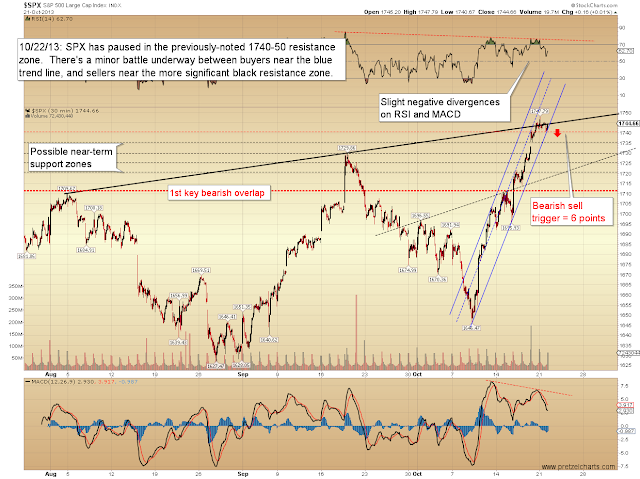 If BKX goes on to make new highs here, the fractal will be an exact copy, complete with the truncated c-wave decline. We really haven't seen much in the way of "normal" corrections since QE-Infinity kicked in -- most every correction has fallen short of its typical expectations. In the current wave, usually I'd look for this rally to be a fake-out, which then allows the pattern to reach its typical downside resolution (shown in red). In this market, though, the One Big Buyer may not allow it. Phrased in less dramatic terms: there may simply be too much liquidity floating around for equities to correct "as usual" until QE tapers or ends. 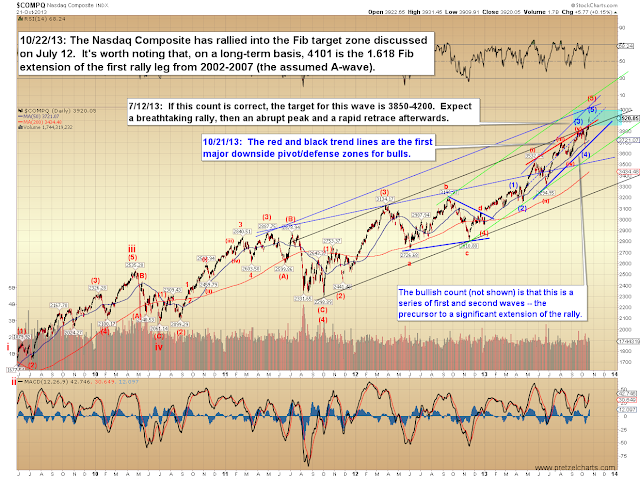 The Nasdaq Composite has now rallied into its Fibonacci target zone from early July. This isn't much aid for short-term trading, but from a longer-term perspective, it's of some value to watch how the market reacts to this zone. Like any trading system, Elliott Wave Theory derives its value from anticipation. And that anticipation comes from identifying the fractal the market is "trying" to form next. The challenge, which I outlined in a few different ways last week, is that there are points where you can't really be sure what the fractal is, and you simply have to take a step back and wait it out. When the market reaches those points, I generally simplify my approach -- assuming I choose to attempt to trade at all during such times, which I sometimes don't. With simplification in mind, here's a straightforward trend line chart, with a small bearish sell trigger noted at yesterday's low. 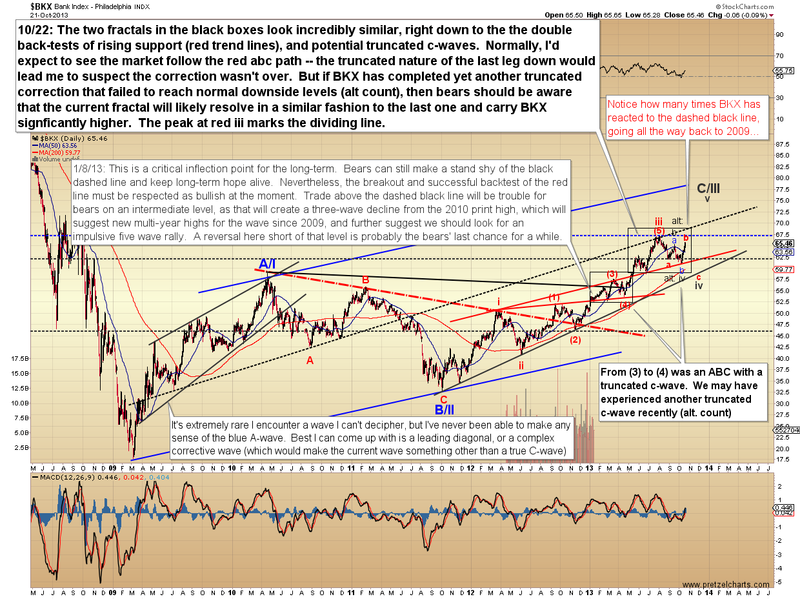 The first step for bears is to force a breakdown of the blue melt-up channel. 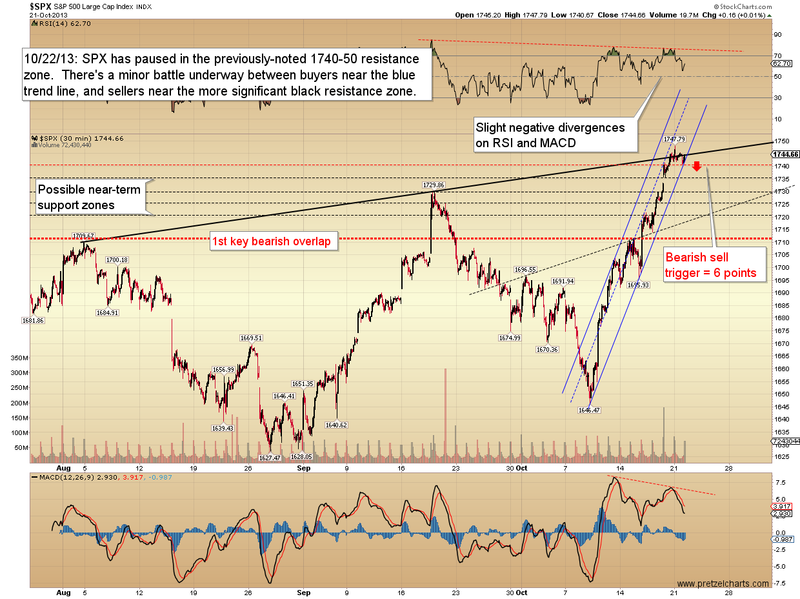 The next step for bulls remains the 1750 +/- zone. In conclusion, the market remains poised at a larger inflection point. The last noted inflection point was on October 10 -- so inflection points do have the potential to generate strong reversals. As of yet, however, that potential remains unrealized, and the uptrend remains intact. Trade safe. Price action still looks pretty bullish on the SP500 (at 1756 as I write this). The RSI is starting to approach overbought levels. My guesstimate is that we'll see some kind of pullback by the end of the month or the beginning of November. Then again I could be wrong. This Emini dip overnight is a blessing from the skies, and I am loading up as I write. Momentum is a very sticky beast and there are plenty of bears to hunt. DO NOT turn your back on a friend........called trend!